While going through some older images, in preparation for an Adobe Lightroom training seminar I'm teaching this weekend, I came across images of my Yes Watch that I bought some time ago. I had intended on doing some sort of a "review" of this watch but never got around to it. I likely won't be putting one up that is super detailed, but thought I'd post a quick note since this watch is a very interesting timepiece for the photographer or filmmaker. Firstly, Yes watches are certainly not inexpensive, but they are uniquely functional and very well made. Mine, a slightly modified 'Inca' model, is made of solid titanium, case and band, and has a sapphire crystal with antireflection coatings. It is water resistant to 10 atmospheres (300 feet) as well. Check out the amazing kit you get (the above photo) when you buy one one of these. 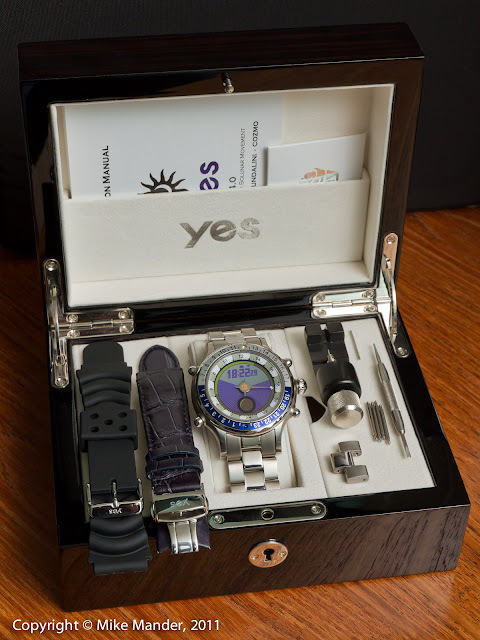 Not only does it come in a gorgeous, thickly lacquered wooden display box, but you get three watch bands (rubber, leather and titanium), spare link pins with a link removal tool, spare spring pins and a spring-pin pick tool. You can see I removed one link to make the watch fit my wrist better. What makes it so interesting is the fact that it graphically shows the amount of daylight and darkness in the current 24 hour day, and with its single 24 hour hand, it shows precisely where in the day/night cycle one currently is. Of course this lets you read the sunrise and sunset times as well. It also shows the same data for the moon in a narrow ring surrounding the main day/night display. Their website, linked to above, has more detailed info if you want to know more about all the functions. I am bouncing around a bit with these entries from my Germany trip. This evening I was preparing to email some images of her studio to my aunt on Föhr, and I just decided to post a gallery of images from the last day on the island instead. The first image of my 80 year old aunt Ruth was taken with the wickedly sharp Leica (Panasonic) 25mm f/1.4 lens again, at ISO 640 on my GH2... too sharp for a portrait really. I hope she doesn't mind too much! Most of the tighter shots in the gallery, such as the one above, were taken with the 25mm lens as well. The last day on Föhr was relaxing. 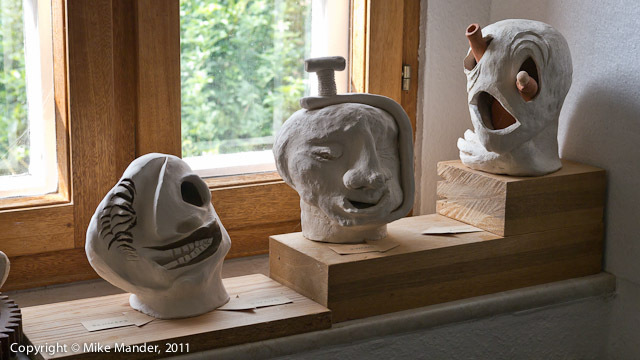 We spent a lot of time with my aunt, and I took some photos in her attic studio, which had a lot of her sculptures, many quite unusual, and her watercolour paintings on display. Click the image above to visit the gallery. You might notice a slight change to the look of this blog! I want to be sure to direct people back to the main Beau Photo store blogs page, so I decided to change the banner and remove the Beau logo. That way hopefully people won't think they are on the official Beau blog for some reason. I also added a "Looking for Beau Photo content?" section that will appear above the regular blog postings for the next month or so, helping to direct traffic destined for Beau Photo to the real Beau blogs. Lastly, since I was making a new banner anyway, I also took the opportunity to widen the layout a tiny bit. Without going into technical details, this will make it way easier to post images that are optimally sized to fit the exact width of the blog entries. You'd think that Blogger would have some sort of "fit width" command for images, but no. I had to essentially manually edit the HTML for every post that contained a horizontal (landscape) format image! The Blogger image presets either made for an image that was way too small, or one that was just a little too big. What a pain! I also made sure to make the Beau Photo blogs wider from the get-go, to make it easier for people to post images. Anyway, I hope you like the new banner and slightly wider content. This change will make it much easier to post a quick blog entry in the future too! New: Beau Photo Supplies Store Blogs! Effective immediately, I will be changing the tack of new postings on this blog. I created this as an experiment originally, wanting to see how well received a Beau Photo information and announcement blog would be. In addition, I wanted to experiment with blogging my own images and gallery content on a more regular basis, versus less frequent website updates. Heck, my website is, at the moment, horribly out of date, finishing at the end of 2009 as far as image gallery content goes! Anyway, this blog has been quite well received by Beau Photo customers so far, and despite the minimal "followers" that are visibly subscribing, I know there are many more checking it out on a regular basis. The feedback has been very good overall, so I have created a new store-wide Beau Photo Blog, with a permanent link in the Pages section on the right as well. From this point forward, this blog will simply be about items of personal interest, image galleries, trip blogs, photo projects, announcements of updates to my website and so on. Beau Photo content will be minimized here and the vast majority will be posted directly to the Beau Photo blog in the future. At this point, I am not sure how feasible it will be to move my existing Beau Photo related postings to the new blog. Not very possible, as far as I can tell, at least not without an enormous amount of work. I will probably create a filtered link back to this blog from the Beau Photo blog and I may remove all the Beau Photo related categories from here as well, to avoid the clutter - In Stock at Beau, Rebates, Sales and so on. Those categories will no longer be relevant to future content I post here. Park Wilhelmshöhe is in Kassel, my father's hometown. Twice a week, this 300 year old park has Wasserspiele, which in English maybe could be called a water festival or waterworks? 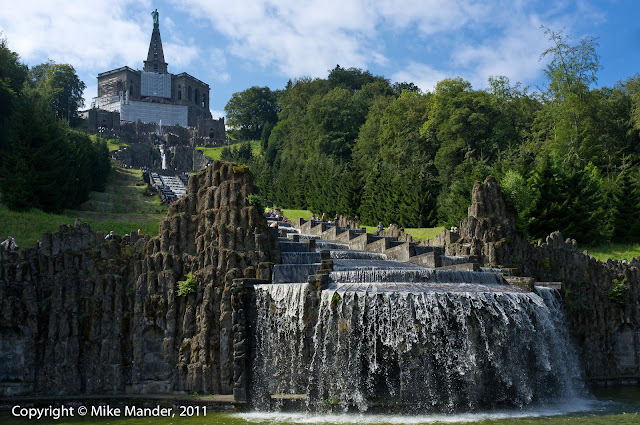 Basically, there is a large reservoir on top of the 750 foot high hill where the Hercules statue is situated (above photo), and valves are opened letting water down a series of manmade falls, a reconstruction of a Roman aqueduct and more. The last week in Kassel, and then in Frankfurt, had frustrating Internet access in the hotels. Surfing was fine, fast even, but upload speeds were a joke. I was getting around 50 bytes/sec speeds. That's BYTES, not kilobytes! There was no point in trying to update the blog with images or image galleries. Kassel wasn't quite as bad but it seemed as though I ran out of time every night as far as updating the blog. Anyway, the three weeks went by too quickly as usual. We drove about 4000km in the BMW turbo-diesel wagon. Average fuel consumption was around 7.2 l/100km. Considering that my Autobahn cruising speed was generally about 150-180 km/h, I'd say that is pretty impressive. One one leg of constant 160km/h it averaged around 6.8. I hit 220 in the BMW for a short stretch but didn't want the stress of driving that fast for too long. I am all "schnitzeled out" too. An amazing variety of good food, good pastries and German beer means I definitely need to cut back after I return!